THQ Nordic may have just accidentally revealed that Darksiders would be arriving on the Nintendo Switch, introducing the 'Warmastered Edition' and its leaked trailer. According to Nintendo Wire, THQ Nordic, the publisher behind the Darksiders franchise took to their main website today to post a video. The video was quickly removed by THQ Nordic, but before that could be done the website Vooks.net managed to make a copy. 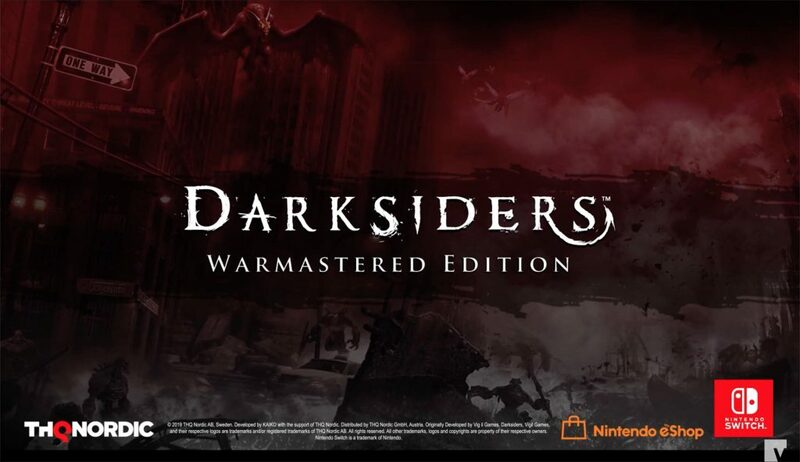 At the end of the above video we can see the 'Darksiders Warmastered Edition' and most importantly both the Nintendo eShop and Nintendo Switch logo. I wouldn't be surprised if these video trailers are taken down soon, as THQ Nordic would most likely ban them under copy right laws. I would also expect that sometime soon an official announcement will take place. At the moment there is no known release date for the 'Warmastered Edition' arriving on the Nintendo Switch, I will be sure to update you with a follow up once there is one. If you are unsure of what Darksiders is, feel free to check out the game on its official Steam listing here.